Kundapur, Feb 6, 2015 : Shivamogga MP and former CM BS Yeddyurappa has alleged that the state government order banning entry of Praveen Togadia to Bengaluru was just an attempt to divert public attention from the administrative failure of the government. 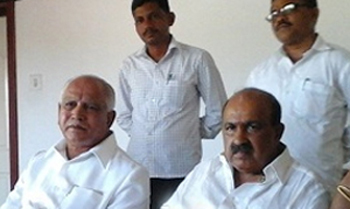 Speaking to reporters here on February 5, Wednesday, Yeddyurappa demanded that the state government reconsidered its decision to ban entry of Togadia. The senior BJP leader also accused the state government of suspending several of the welfare programmes initiated by the erstwhile BJP government. On the reports about the state government’s willingness to re-introduce lotteries, Yeddyurappa warned that the BJP will hold protests if the government introduces lotteries. Tingale Vikramarjun Hegde, District BJP President, Sukumar Shetty, Byndoor unit BJP Chief, Gitanjali Suvarna, ZP Member and other BJP leaders were present.